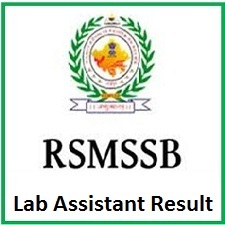 RSMSSB Lab Assistant Result 2019: The Aspirants looking for where to get the RSMSSB Lab Assistant Result may not worry anymore. The information is given in this article. The Rajasthan Subordinate and Ministerial Service Selection Board are going to release the Results along with the RSMSSB Lab Assistant Cut Off Marks in the month of March 2019. Also, many candidates attempted the Lab Assistant Written Exam on 3rd of February 2019. And, make a note that the Job Location is Rajasthan Only. Furthermore, go through this post and get an idea regarding the RSMSSB LA Merit List. You can check RSMSSB official website i.e. rsmssb.rajasthan.gov.in to check results. The candidates can also check the table given below for the complete details of the Rajasthan Subordinate and Ministerial Service Lab Assistant. Moreover, the many hopefuls are eagerly waiting to know their results and also the Cut Off Marks decided by the Board of Rajasthan. Probably, the aspirants can check using their Hall Ticket number and password in the required fields and get their rsmssb.rajasthan.gov.in Lab Assistant Result. Scroll down for much more details of the Results and RSMSSB LA Merit List and the downloading process. 1.4 How To Download The RSMSSB Lab Assistant Result 2019? Some people don’t know how to download a Result and they were in a state of confusion where to get them. For the sake of those applicants, we had given step by step process to follow for them. Also, RSMSSB Lab Assistant Cut Off Marks are given in a table format. So that everyone can understand the information in an easy way. After getting the Result, the candidate should check the Merit List and verify whether they were qualified in the exam or not. Hopefuls who want clear this examination have to score well as per the cut off list mentioned by the Officials of the Rajasthan Subordinate and Ministerial Service Selection Board. RSMSSB Lab Assistant Cut Off Marks depends on some factors such as difficulty level of paper, a number of candidates appeared in the examination, number of posts, the category of the candidate. However, the cutoff marks play a crucial role to select candidates. The category wise cut off marks are given in this section. It helps you to know your result and the qualifying status. Merit List is released along with the Result in the month of March 2019. The Merit list is prepared based on the cut off marks and the candidates who secured the highest score. So, cut off marks and merit are two barriers for an examination. The Merit List consists of a list of candidates promoted for further rounds. Also, you should keep in mind that the RSMSSB LA Merit List contains of the list of the candidates got selected in the Written Test Of the Lab Assistant. How To Download The RSMSSB Lab Assistant Result 2019? Move to the Official website www.rsmssb.rajasthan.gov.in of the Rajasthan Subordinate and Ministerial Service Selection Board (RSMSSB). Check for the RSMSSB Recruitment 2019 on the Home Page. Next, search for the link of RSMSSB Lab Assistant Result 2019 and click on it. Now, Fill the details correctly such as Name, Password, Registration Number etc., for Logging purpose. Finally, you will find your rsmssb.rajasthan.gov.in Lab Assistant Result on the Screen. Is so, download the Result 2019 and make a copy of it for future use. Hope you understood the above-given rsmssb.rajasthan.gov.in Lab Assistant Result details. Moreover, the results, cutoff marks and merit lists will release from official website link which is given above. Also, you can find other Latest Results from our website Fresher Now. Drop a comment for any questions and doubts. soon we will respond to you with suitable answers.